Jeep Van Wormer only led five of the 40-lap Barney Oldfield Race at Oakshade Raceway Saturday night, but it was enough to earn him the victory and a check for $4,100. Scott Fisk started on the outside of the front row for the 16th Annual Barney Oldfield Race and led the first 35 laps. Fisk pulled away from the rest of the field until Tony Marks got by Rick Delong for the second position and began to close in. Brian Ruhlman and Rusty Schlenk also worked their way toward the front of the field and eventually caught the second place automobile driven by Marks. The three battled three wide for second just behind leader Scott Fisk. Schlenk, who already has two Late Model feature wins under his belt this year, caught Fisk and the two raced side by side for the lead around lap 26. Fisk and Schlenk tried to split the slower car of Rusty Seaver with Fisk going high and Schlenk on the inside. Schlenk spun and brought out the caution on lap 31 which ended his chances for another feature win. That turned the second position over to Jeep Van Wormer. Fisk was able to hold off the challenge from Van Wormer until lap 35 when he got into turn four a little too high and slipped back to fourth. Fisk worked his way back to second in the closing laps but couldn’t reel in the 55 car of Jeep Van Wormer. 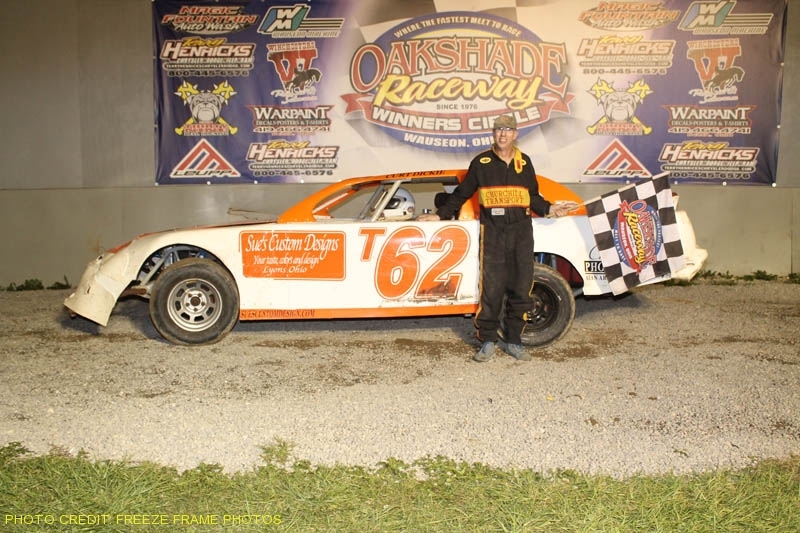 It was Jeep’s first Late Model feature win of the year at Oakshade and along with the $4,100, he was also presented with the Raceway Energy’s and Wyse Excavating Barney Oldfield Trophy. Tony Marks ended up finishing third with Rody Schroyer and Rick Delong completing the top five finishers. The Sportsman feature started off with a couple of hard crashes. The first of which occurred after Tim Bernard spun and collected the cars driven by Ray Klawitter and Chris Keller. Only Klawitter would continue after his car received some work in the pits. The second yellow happened on lap two after Brian Roop lost control of his car in turn two while battling for the lead. Bruce Stuart drilled Roop head on. Tim Fisher and Brian Fisher also got caught up in the wreck. Mike Jessen shook out as the leader once some green flag laps were run. Josh Steinacker worked his way up to second and then began to fade back before getting turned around in turn three on lap 12. Jessen fell back to fourth after the restart. Rich Noonan held the lead for a short while until the eventual winner Joe Derbeck took over. Mike Jessen closed back in on the leader, Joe Derbeck, but could not reassume the lead and settled for a second place finish. Rob Liaeff finished third ahead of Rich Noonan and Ron Schultz. It was Joe Derbeck’s first Sportsman feature win of the year. The Bomber A Main produced one of the most exciting finishes of the evening. Last week’s C Main winner, Matt Shipley, took the lead on the first lap from Scott Mills. Mills was involved in a multi-car accident on lap two to bring out the first yellow of the race. Bob Rendel, Brett Miller and Keven Hanford were also involved. Caution flags continued to keep the field tight throughout the race which allowed Bob Gregory to put the pressure on Matt Shipley for the lead for most of the race. Shipley held on to win by three quarters of a car over Gregory. Jeff Foks Jr. finished third and Jim Scout was fourth. Tony Mapes got loose in turn two on the first lap of the Bomber B Main and collected at least seven cars in a huge pile up that resulted in a complete restart. Gary Domoe led Nick Fenner for much of the race and ended up finishing in that order when the checkered flag flew. Chris Williams was third while Dave Sibberson and Josh Montague were fourth and fifth respectively. Ron Leonard was the race leader early in the Bomber C Main until the left rear wheel came off sending his car spinning down the backstretch. Karl Spores assumed the lead as the caution came out but his lead was short lived as he retired to the pits just after taking the lead. Josh Overmeir became the next leader. After a series of cautions early, the field that started with 19 cars only had eight running and only one lap of green flag racing officially scored. Todd Silvey, Jeff Foks and Overmeir went three wide for the lead on lap two with Silvey coming out of it with the lead. Silvey went on to pick up the victory over Jeff Foks, Jim Guinn and Josh Overmeir. Saturday, June 25th, Oakshade Raceway will host the Butch Wildermuth Memorial in conjunction with the second American Late Model Series event of the year. $3,000 will go to the winner of the Butch Wildermuth Memorial ALMS Late Model feature. The Sportsman and Bomber divisions will complete the night’s racing program.